The Rama IX is the World's longest single plane cable-stayed bridge crossing the Chao Phraya River connecting the eastern and western sides of Bangkok. The bridge was opened in 1987. The total length of the bridge is 782 meters, comprising of a 450 meter main center span and two 166 meter side spans. The eastern side concrete pier of the side span was found to have a visible continuous vertical cracks and secondary cracks running branching off from the vertical cracks. To determine the crack depth and overall structural integrity of the bridge, IMMS had provided several types of Non Destructive Testing (NDT). Impact echo method was used to determine the concrete soundness and crack depth, and Half-cell potential method was also used to evaluate the corrosion on reinforcing steel rebars of the pile caps. - Evaluate tension forces in cables, total of 68. - Evaluate dynamic properties of 16 tune mass dampers. - Determine cable's damping ratio and verify damping properties of cable dampers. 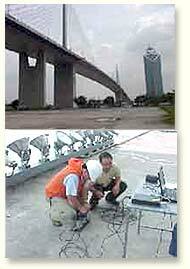 - Perform Finite Element Analysis (FEM) of the bridge structure by making use of the parameters measured in the field. Loading assigned in FEM model was in compliance with AASHTO and DIN code requirements. - Calculate allowable elongation of cables by structural compatibility and stability analysis.